Full length native protein (purified) corresponding to Cow SDHA. Purified mitochondrial complex II (Cow). Product was previously marketed under the MitoSciences sub-brand. Near homogeneity as judged by SDS-PAGE. The antibody was produced in vitro using hybridomas grown in serum-free medium, and then purified by biochemical fractionation. Our Abpromise guarantee covers the use of ab14715 in the following tested applications. ICC Use a concentration of 0.2 µg/ml. Requires heat-induced antigen retrieval where aldehydes are used as fixatives. Use 20min incubation at 90-100°C in 0.1 M Tris/HCl pH 9.5 with 5% urea (wt/vol). Flow Cyt Use a concentration of 1 µg/ml. WB Use a concentration of 0.1 µg/ml. Detects a band of approximately 70 kDa (predicted molecular weight: 70 kDa). Flavoprotein (FP) subunit of succinate dehydrogenase (SDH) that is involved in complex II of the mitochondrial electron transport chain and is responsible for transferring electrons from succinate to ubiquinone (coenzyme Q). Carbohydrate metabolism; tricarboxylic acid cycle; fumarate from succinate (eukaryal route): step 1/1. 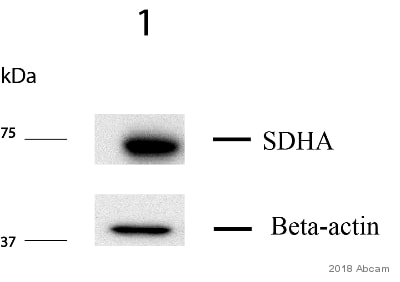 Defects in SDHA are a cause of mitochondrial complex II deficiency (MT-C2D) [MIM:252011]. A disorder of the mitochondrial respiratory chain with heterogeneous clinical manifestations. Clinical features include psychomotor regression in infants, poor growth with lack of speech development, severe spastic quadriplegia, dystonia, progressive leukoencephalopathy, muscle weakness, exercise intolerance, cardiomyopathy. Some patients manifest Leigh syndrome or Kearns-Sayre syndrome. Defects in SDHA are a cause of Leigh syndrome (LS) [MIM:256000]. LS is a severe disorder characterized by bilaterally symmetrical necrotic lesions in subcortical brain regions. Defects in SDHA are the cause of cardiomyopathy dilated type 1GG (CMD1GG) [MIM:613642]. CMD1GG is a disorder characterized by ventricular dilation and impaired systolic function, resulting in congestive heart failure and arrhythmia. Patients are at risk of premature death. Belongs to the FAD-dependent oxidoreductase 2 family. FRD/SDH subfamily. 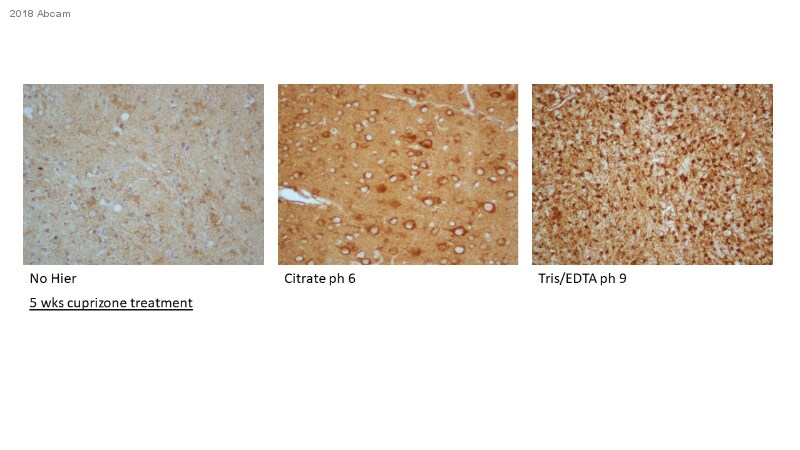 ab14715 (2µg/ml) staining SDHA in human testis using an automated system (DAKO Autostainer Plus). Using this protocol there is cytoplasmic and mitochondrial staining within the seminal vesicles. Sections were rehydrated and antigen retrieved with the Dako 3 in 1 AR buffer EDTA pH 9.0 in a DAKO PT link. Slides were peroxidase blocked in 3% H2O2 in methanol for 10 mins. They were then blocked with Dako Protein block for 10 minutes (containing casein 0.25% in PBS) then incubated with primary antibody for 20 min and detected with Dako envision flex amplification kit for 30 minutes. Colorimetric detection was completed with Diaminobenzidine for 5 minutes. Slides were counterstained with Haematoxylin and coverslipped under DePeX. Please note that, for manual staining, optimization of primary antibody concentration and incubation time is recommended. Signal amplification may be required. Mitochondrial localization of complex II visualized by immunocytochemistry using ab14715. Cultured human embryonic lung-derived fibroblasts (strain MRC5) were fixed, permeabilized and then labeled with ab14715 (0.2 µg/ml) followed by an AlexaFluor® 488-conjugated-goat-anti-mouse IgG2a isotype specific secondary antibody (2 µg/ml). Skeletal muscle immunohistochemistry using ab14715. Fixed frozen tissue sections from a patient with a single large deletion of the mtDNA were used. All muscle fibers exhibit complex II immunoreactivity, consistent with the nuclear DNA-encoded expression pattern of this and all other subunits of complex II. ICC/IF image of ab14715 stained human HeLa cells. 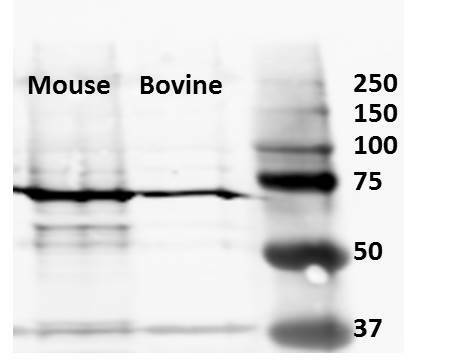 The cells were 4% PFA fixed (10 min) and then incubated in 0.1% PBS-tween diluted 1%BSA (OR 10% goat serum OR 0.3M glycine) for 1h to permeabilise the cells and block non-specific protein-protein interactions. The cells were then incubated with the antibody (ab14715, 5µg/ml) overnight at +4°C. The secondary antibody (green) was Alexa Fluor® 488 goat anti-mouse IgG (H+L) used at a 1/1000 dilution for 1h. Alexa Fluor® 594 WGA was used to label plasma membranes (red) at a 1/200 dilution for 1h. DAPI was used to stain the cell nuclei (blue). This antibody also gave a positive IF result in Hek293, HepG2 and MCF7 cells. HL-60 cells were stained with 1 µg/mL ab14715 (blue) or an equal amount of an isotype control antibody (red) and analyzed by flow cytometry. 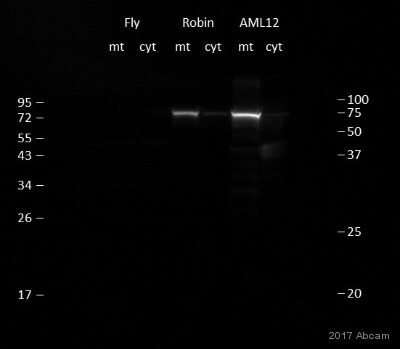 Mitochondrial and cytoplasmic fractions were obtained from whole flies with Abcam Mitochondrial Isolation Kit for Tissue (ab110168) and from robin fibroblast and mouse hepatocyte cell lines with Abcam Mitochondrial Isolation Kit for Cells (ab110170). HRP-conjugated Horse Anti-mouse IgG at 1 μg/ml was used as a secondary antibody. Publishing research using ab14715? Please let us know so that we can cite the reference in this datasheet. Thank you for contacting us. We do not know the epitopes to which this mAb binds. The immunogen was a full-length endogenous protein, of bovine origin; this antibody detects Hu, Ms, Rat, Ce, Cow, Dog SDHA protein and its specificity is fully guaranteed. I hope this information is helpful to you. Please do not hesitate to contact us if you need any more advice or information.